It may seem like the release of Titan Books' BioShock novel is oddly timed, given how 2K Games is set to abandon Rapture entirely and take to a new setting next year with BioShock Infinite, but it's still an exciting prospect for the literary-minded. The BioShock universe, with its Randian politicising and cast of crooks and billionaires, is ripe with potential. It's therefore gratifying to see that Rapture, which is written by Bram Stoker Award-winning author John Shirley, explores the origin of Andrew Ryan's aquatic megalopolis. After two BioShock games, we know enough about those who tore down Rapture, but we want to know more about those who built it up. We want to know Andrew Ryan and his anti-cadre in their own words. Unfortunately, it's here that the Rapture novel starts to stumble, as few of the characters feel believably voiced thanks to the unusual focus that's put on to bringing their accents or linguistic idiosyncrasies to life. Bill McDonagh, Ryan's lead engineer and the sympathetic underdog of the novel, has so many unbelievable English archaisms shoved into his mouth that he ends up looking like a parody of himself. Ryan doesn't fare much better, with his motivations and beliefs - which seemed so salient and deep in the game - starting to crumble or contradict in the novel. What makes it all so unusual, however, is that there's little wrong with Shirely's writing in a broader sense; the language alone is far beyond what we've seen in previous game novelisations. The plotting too, while trope-ish and predictable even for those who haven't played the game, is still tightly structured and hides a few minor surprises. Rather, Rapture's problem is that the characters are clearly not Shirley's own invention; he's playing with another boy's toys and isn't quite as capable with them as he might be with his own. 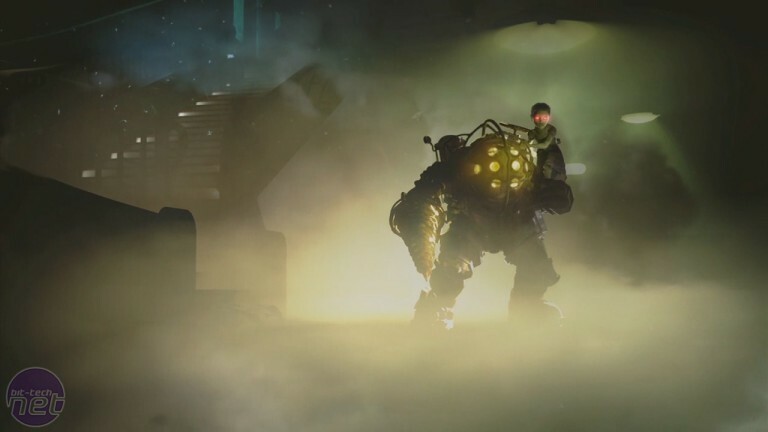 Nowhere is this more apparent than with Fontaine, the con-man and usurper who eventually goes on to become the end-game boss of the original BioShock. Fontaine (and that's not his real name, by the way) initially contrasts excellently against hard-working Bill McDonagh, but as the plot unfolds he quickly becomes too powerfully villainous to be credible. He's always got an angle, a disguise, a way of getting what he wants, and it often feels like other characters are bending over backwards to help him. 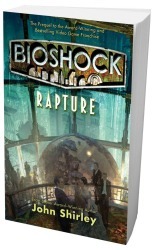 For all its faults, however, BioShock: Rapture remains a fundamentally decent book at its core. Shirley may not be able to conjure enough life into the characters to make them work at full efficiency, but the tale still wobbles along until the excitement of Rapture's civil conflict starts in full and Shirley lets the city itself become the main character. One area where he never fails is when he's capturing the scope and splendour of Ryan's underwater urbania, which is captivating from the first time McDonagh is given a chance to see it. 'Fundamentally decent' - a term you could also use to describe Ryan himself - isn't enough to win any glowing recommendations, however. Shirley certainly manages to regain ground in the latter portions of the book, but the fact remains that the opening third is an uphill struggle through needless, wonky accents and slippery characterisation. Ardent fans of the BioShock series will doubtless approve of any chance to revisit Rapture, but others would do better to explore the influences behind the game rather than the now third-hand interpretation of those ideas.